This series of twelve 30- to 45-minute Feldenkrais lessons was designed for and created in collaboration with breast cancer survivors. The gentle lessons provide relief from post-treatment symptoms and assist the user in gaining deeper relaxation, enhanced vitality, greater flexibility, and improved emotional well-being and comfort. A unique tool on the journey towards recovery, Unbound! instills the confidence that change, and therefore healing, is possible. 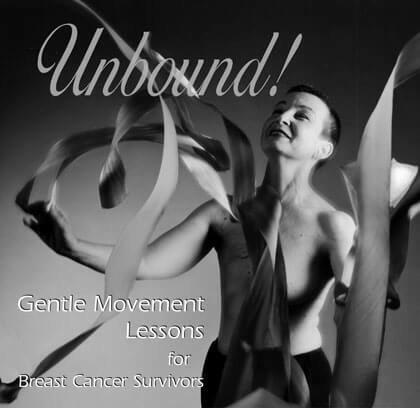 “Unbound!” is a must for any woman recovering from breast cancer. It is obvious that the lessons were developed from working with women whose bodies have been traumatized by surgeries and other cancer treatments. It’s a great way to regain mobility and facilitate healing.